The waterfront walkway in the Old Town of Nice on the French Riviera in the Provence, France in Europe. Shops line the beach waterfront walkway in the Old Town of Nice in Provence, France in Europe as tourists get a break from the sun and enjoy a cooler cloudy day for a little sightseeing. Tourists get the best of both worlds in Old Town of Nice as they can suntan and swim for part of the day and then walk the waterfront and do some shopping for the last half or vice versa.Along this scenic waterfront you will find sandy beaches, beautiful views of the azure colored sea, restaurants, shops, bars, theaters, museums, galleries and unique stores only found on the French Riviera in the Provence, France. Some people just like to enjoy the outdoors and go for a walk, roller skate, skateboard or bike along the waterfront.Many visitors come to the French Riviera every year including a variety of famous people to enjoy the sun and exciting countryside of the Old Town of Nice in France, Europe. 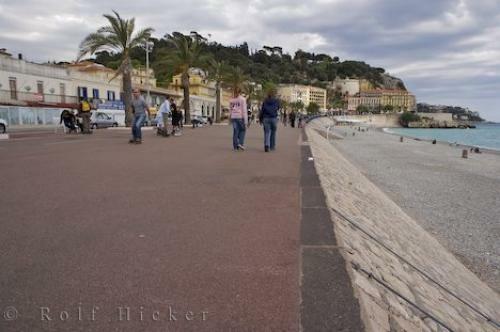 Waterfront and beach in the Old Town of Nice, Riviera, Provence, Cote d'Azur, France, Europe. Photo of the beach and shops along the waterfront on the Cote d Azur in the Provence, France in Europe.